The fourth annual feast & food drive returns to Ardent on Thursday, November 15, featuring main dishes from Autumn Olive Farms & ZZQ, as well as side dishes and desserts from some of your favorite chefs and restaurants around RVA. 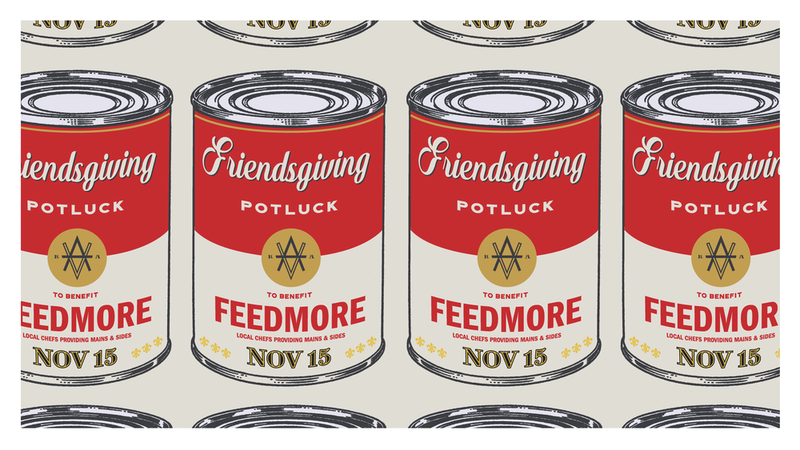 To reserve your plate, just donate 15 food items in the taproom anytime between now and the start of Friendsgiving. The food you donate will go directly to Feed More to support their work feeding children, families, and seniors across Central Virginia through programs like Meals on Wheels, the Central Virginia Food Bank, the Mobile Pantry, and Kids Café. Need some help deciding what to give? Feed More recommends high fiber, low sugar, and low sodium foods. See this graphic for specific suggestions, including peanut butter, cereal, canned fruits and vegetables, and more. If you’d prefer not to donate food, you can instead buy a $15 ticket to join the Friendsgiving fun, with 100% of ticket proceeds contributing to Feed More. In addition to the feast, we will also be releasing our Barrel Aged Barleywine during this year’s Friendsgiving. We kicked our barleywine up a notch by aging it in bourbon barrels for 12 months! Barrel Aged Barleywine is a malty, full-bodied barleywine that pours a dark brown color. This big, boozy beer balances notes of vanilla and oak aromas with a moderate alcohol heat and rich, complex flavor. Great food, great beer, and great company, all for a great cause!